This tutorial uses Virtual Android running on VirtualBox. However, the steps are applicable to real device as well. 2.1) Install from https://play.google.com/store/apps/details?id=com.aide.ui (Alternative Download). 3.1) DroidEdit https://play.google.com/store/apps/details?id=com.aor.droidedit (Alternative Download). 3.2) AndroZip, https://play.google.com/store/apps/details?id=com.agilesoftresource (Alternative Download). DropBox Cloud storage makes it easy for beginners to store and share their projects online. 4.1) Create a DropBox Account. 5.4) Tap the three-dots button at the bottom right of the screen. 5.6) Tap the icon “Download DropBox Folder here”. 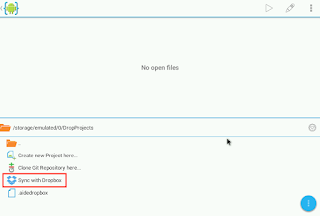 5.7) A Dialog pops up and display list of your DropBox folder. Select “DropProjects” folder and tap “Download” button. Once your folder is synchronized with DropBox, you can start building Android Projects. 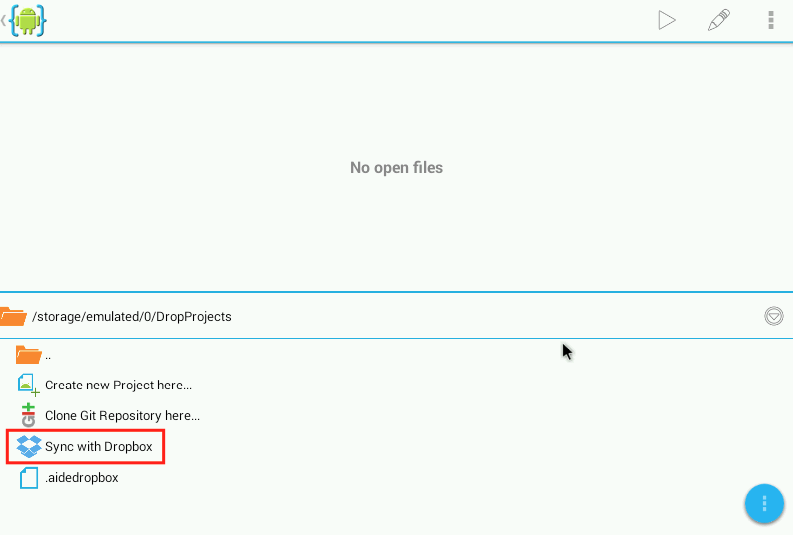 (Sync is active when you see the menu “Sync with Dropbox” appears in the file explorer panel.